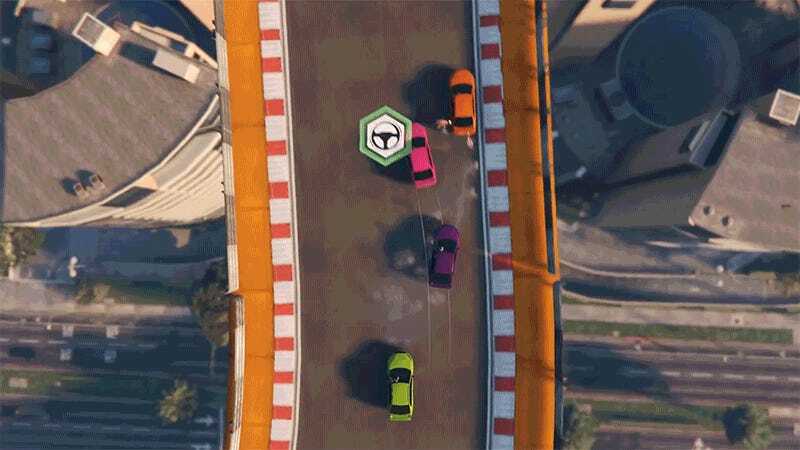 Grand Theft Auto Online’s Tiny Racers update, releasing next week, applies a little historical perspective to the game’s stunt racing, a callback to the series’ top-down origins. Before Grand Theft Auto III intruduced us all to free-roaming vehicle thievery in 3D the series was all about the top-down perspective. Grand Theft Auto, Grand Theft Auto II and the two ‘60s-style Grand Theft Auto: London games all took place from the topside looking in. We got another taste of top-down GTA with 2009's Chinatown Wars for the PSP and DS, but for the most part it’s been third-person 3D ever since. Well, until next week’s Tiny Racers update. The overhead perspective brings back many fond memories, and it’s sure to generate plenty of news ones as well. The update drops on April 25. Head over to Rockstar Games’ website for more info.